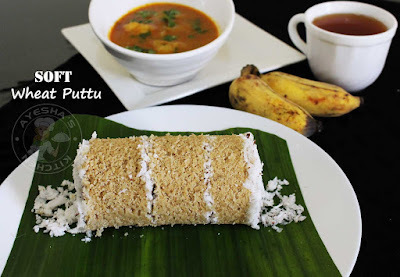 Here am with a Kerala breakfast recipe - Puttu, the staple breakfast recipe of Kerala. It is one of the quickest, simplest and yet healthiest breakfast recipes. 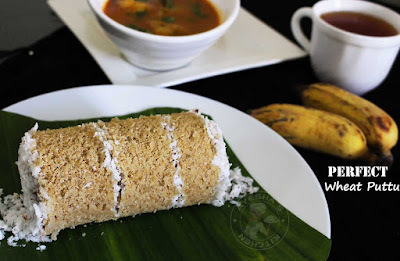 So today lets see how to make Kerala style Gothambu puttu (wheat puttu) at home. This recipe for gothambu puttu will guide you how to make a perfect soft gothambu puttu (wheat puttu). Am sure that this wheat flour steamed cake recipe will never let you down. Take whole wheat flour in a large bowl. Add salt and give a fine mix. To this, sprinkle water little by little until the whole flour gets well moist. Mix gently with your fingers. (the water required to wet the flour varies according to the flour used). Next step is very important for a perfect soft gothambu puttu -Once the flour is wet enough, add this flour to the blender and pulse it for a second. Then open the lid of the blender and again add a tablespoon of wheat flour. Again pulse for a second(be careful, do not blend more). Now you will get a perfect lumps free flour texture. Tip to check right consistency - you can create a small firm ball out of this flour and when crumbled, it will become powder. 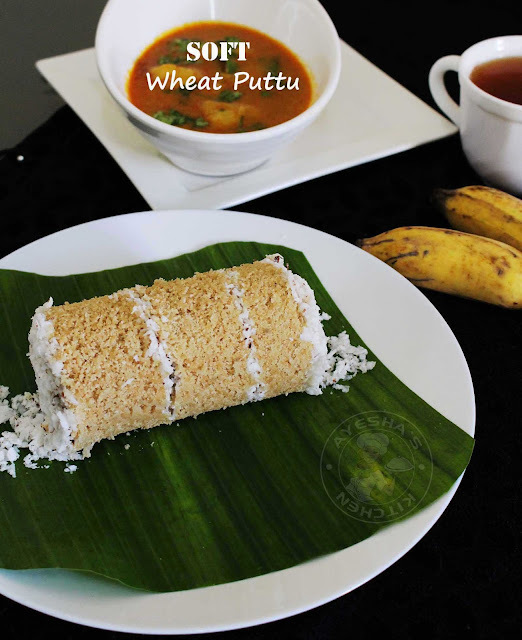 How to make puttu - Now fill less than half of your puttu kudam or pressure cooker with water. Bring it to boil. Meanwhile, fill your puttu kutti or cylindrical tube - Drop the small holed disc inside this tube (do not forget). Then start layering this tube with two teaspoons of scraped coconut, followed by some prepared flour mixture then again with scraped coconut and continue till the tube fills. Top it with its lid. Serve hot along with chickpeas curry or cherupayar curry or simple pazham and pappad.